This green chili egg puff recipe is a family favorite. In fact, this week is when it is traditionally made. Why? The first weekend in April is when we have General Conference. Which is our church's world wide semi-annual conference. We love this weekend for several reasons, but one is that we get to stay home in our pjs, listen to the prophet speak and have a big breakfast. 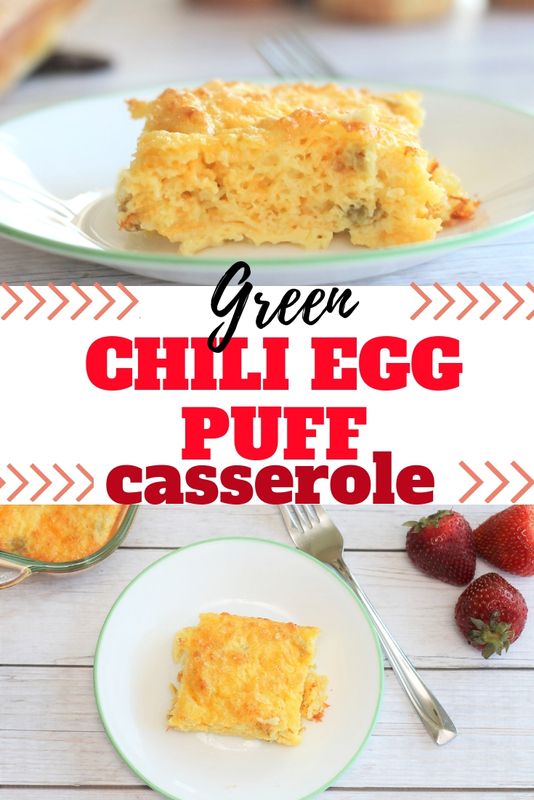 Our family started making this green chili egg puff casserole probably 20 years ago. It's evolved a bit over time but has stay relatively the same. When I was first married, I would just cut the recipe in half and it worked perfect. Now I typically have to double the recipe so we have enough. We also serve this yummy green chili egg puff casserole with muffins, milk or orange juice, and bacon because...well...bacon! For this green chili egg puff recipe, I use cottage cheese, but you can also substitute ricotta cheese. You can also substitute cheddar cheese instead of pepper jack. It takes away a little of the "heat" for little mouths. And it is still super delicious. In a large bowl, whisk eggs until light yellow in color. Mix in jack cheese, cottage cheese, flour and baking powder until well combined. Pour mix into a greased 9x9 casserole dish. Place in oven for 35-40 minutes or until knife comes out clean. Serve hot and top with salsa or fresh pico de gallo.